Ozzy is a 4 year old French Bull dog that presented to Martin Hobbs for a second opinion. Due to his breed conformation he had progressively been suffering with difficulty breathing. This had become worse over the last 12 months and more recently Ozzy had started vomiting when struggling to breathe. He was also suffering with exercise intolerance and his breathing was now noisy all the time, even at rest. On examination Martin noted multiple problems – among these were stenotic nares (narrow nostrils) and marked inspiratory dyspnoea (difficulty in breathing in). 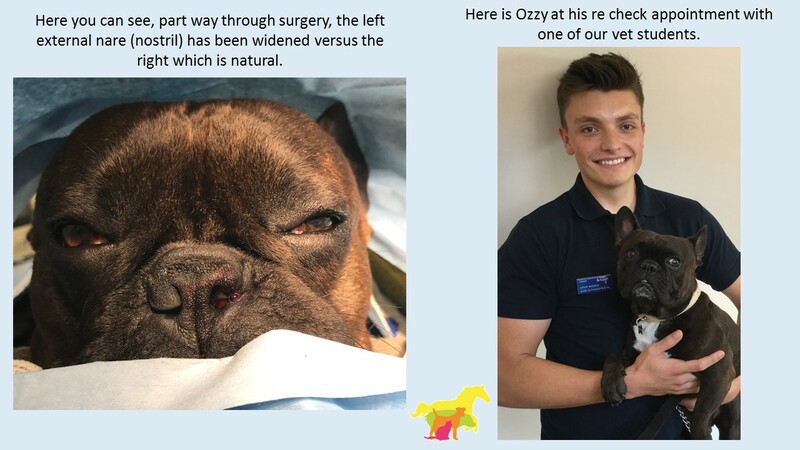 Surgical options were discussed and the owners made the decision to go ahead with further assessment under general anaesthetic and then BOAS (Brachycephalic Obstructive Airway Syndrome) Surgery, if indicated. During surgery Martin removed a wedge of cartilage from the nares (nostrils) to increase the airflow. 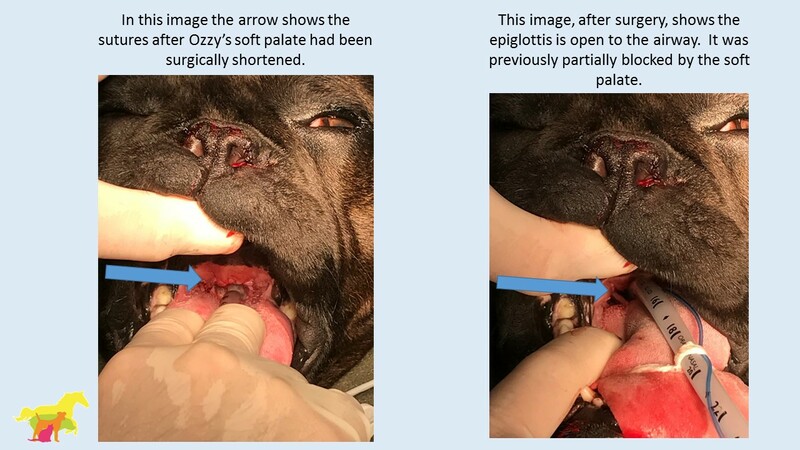 Ozzy was also suffering with an overlong soft palate, therefore this was surgically shortened. This would now reduce the interference of air flow within the larynx, in turn reducing the noise witnessed. Please see the images for a more visual representation of the improvement after surgery. We are pleased to report Ozzy’s breathing has dramatically improved.